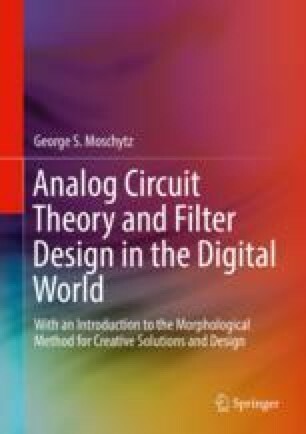 This chapter deals with basic active elements used in active filter and other related analog circuits. Since the material in this book is focused on a system- and network-theoretical rather than a physical device level, the active elements are described in idealized network-theoretical terms. For example, on the physical level, a transistor can be modeled by an intricate T or π equivalent two-port circuit with up to a dozen components, depending on how many non-idealities are included in the model. By contrast, in purely network-theoretical terms, a transistor can be modeled by something called a “nullor” which is an unlikely two-component device characterized by a “null matrix,” consisting of a “nullator” and “norator,” each of which has idealized and fictitious characteristics, such as zero voltage and current across the nullator and arbitrary current and voltage across the norator. As improbable as these “pathological” idealized elements may seem, they are astonishingly useful in developing a first-step circuit design and an initial insightful analysis. However, this initial insight must generally be followed by a second-step detailed analysis, which includes all the non-idealities that need to be considered for a specific application.